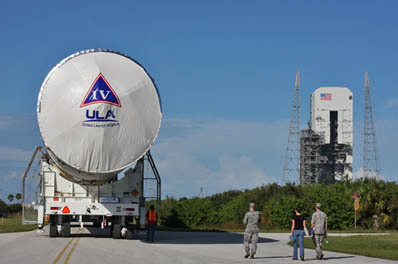 The United Launch Alliance Delta 4 rocket that will deploy a vital communications satellite for U.S. military forces overseas was placed atop its Cape Canaveral pad this week. Liftoff is targeted for January 19 to deliver the Air Force's fourth Wideband Global SATCOM spacecraft into orbit and continue ongoing efforts to upgrade the military's main communications infrastructure. Each WGS has 10 times the capacity of the aging Defense Satellite Communications System spacecraft they are replacing. The satellites supply communications such as maps and data to soldiers on the battlefield, relay video from unmanned aerial reconnaissance drones, route voice calls and data messaging, and even offer quality-of-life considerations like television broadcasts and email delivery to the troops. Now comes WGS 4 early next year with its built-in enhancements to support the higher data rates needed by airborne intelligence, surveillance and reconnaissance missions. The Air Force plans to put WGS 4 into operation over the Middle East and Southeast Asia for U.S. Central Command and U.S. Pacific Command. Getting the 6.5-ton craft into orbit is the mission for the powerful Delta 4 rocket, which began its pre-flight campaign at the launch pad this week. The bright orange and white rocket, stretching 170 feet long, emerged from the Horizontal Integration Facility at 4:30 p.m. EDT Monday. Riding a 36-wheel, diesel-powered transporter, the Delta took an hour-long trip down the road and up the pad's ramp to Cape Canaveral's Complex 37. After the vehicle arrived at the base of the pad, technicians went to work Monday evening getting equipment ready to raise the rocket vertically. The pallets cradling the Delta were tied down to the Fixed Pad Erector and the transporter used to drive the rocket to the pad disengaged to pull away. The erector system and its hydraulic pistons then lifted the rocket upright at 10 a.m. EDT Tuesday, setting the vehicle atop the pad's launch table within 20 minutes. Workers later unhooked the booster from the cradles, allowing the erector platform along with the pallets to lower back to the ground at 5 p.m.
Over the next three months at Complex 37, a full pre-launch test program and the final rocket assembly steps will be carried out, including installation of the four strap-on solid-fuel motors to the first stage and attachment of the payload. WGS 4 is scheduled for shipment from the Boeing satellite manufacturing factory in Los Angeles to Cape Canaveral on November 14 to undergo checkouts and fueling before joining its rocket at the pad. 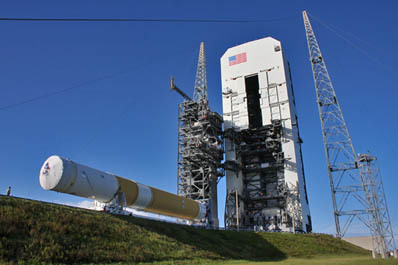 When fully stacked and its nose cone in place, this Delta 4 Medium+(5,4) rocket will tower 217 feet tall. 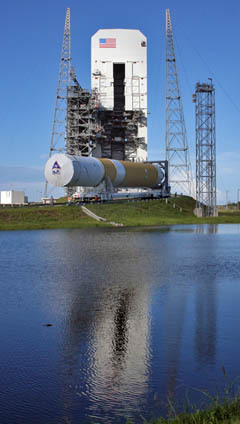 It will be 358th launch of a Delta rocket since 1960 and the 18th for the Delta 4 program since 2002.